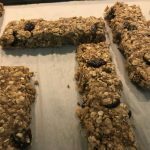 Why not make your own Clif Bar goodness? If you are Vegan or Gluten free ~ these tasty bars are for you! Be creative with your additions like raisins, dried cherries, dried apricots or add any other dried fruit you can think of (without added sugar, of course)! Preheat oven to 300 F.Blend wet ingredients in a food processor or VitaMix. Combine dry ingredients (except chocolate chips/or cherries). Shape dough (on a piece of parchment paper directly on a baking pan) in a square to about 1/2 inch thickness. Cut into bars and separate them about a 1/4 inch apart. Bake for 20 minutes at 300 F.
Cool. Keep refrigerated in an airtight container. *Whole Foods and/or Amazon have no sugar added dried cherries. Previous Post Spring Clean the Negativity! Next Post Prepare Your Garden Now!